How to enable guest checkout only? 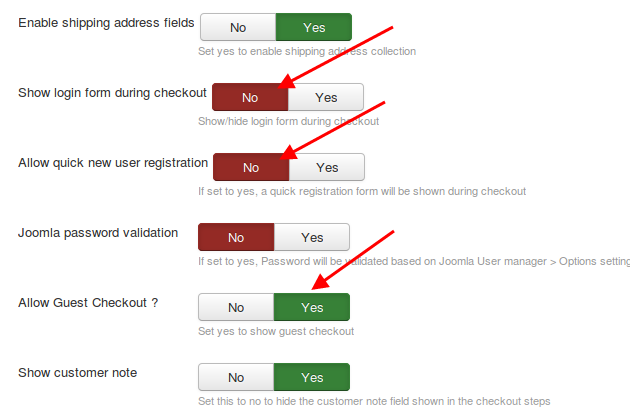 Would you like not to allow customers to register and only want to enable guest checkout alone ? J2Store allows you to do that simple steps. Set YES to Allow Guest Checkout. Is your layout of checkout form displaying in single column? 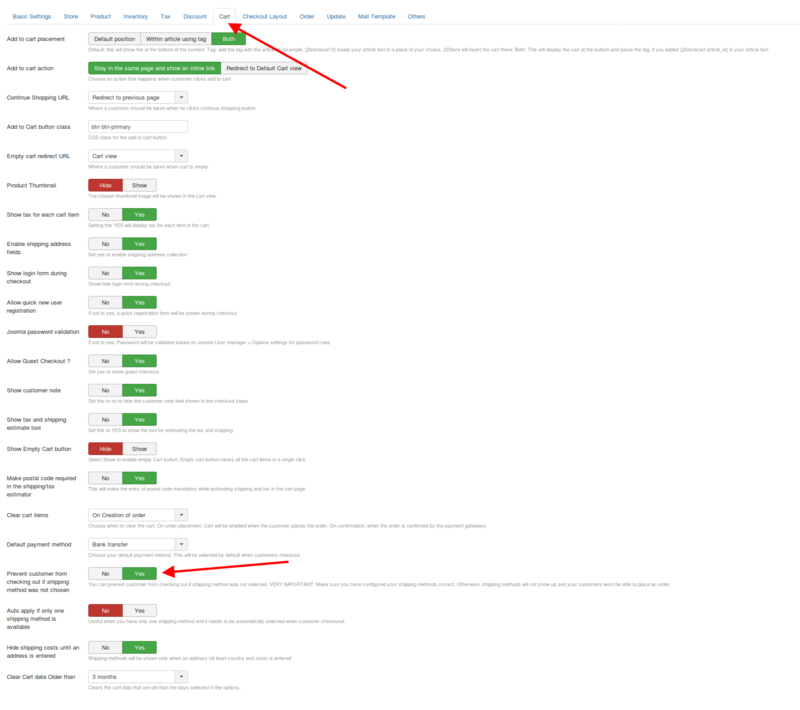 It seems to be choosing of wrong bootstrap class for cart and checkout pages. Go to J2Store > Configuration > Basic settings tabChoose Bootstrap 2.x to Cart and checkout pages should use CSS classesSave. 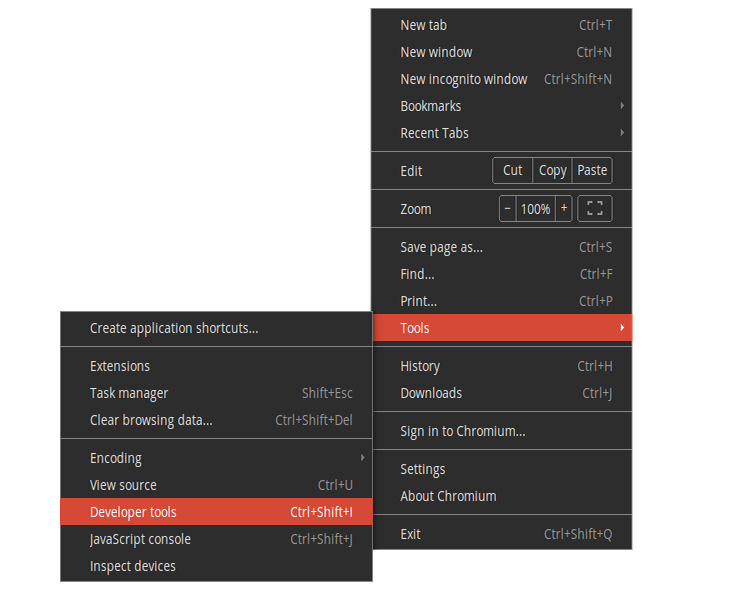 If it is already set to bootstrap 2.x, change to bootstrap 3.x and save.Clear the cache and check. Still issue arises ? You might have added wrong bootstrap class in another place. Do you see some thing like below in checkout billing address layout and checkout shipping address layout? Simply remove this and leave the text area empty. Checkout steps not working ? The checkout steps in J2Store use AJAX extensively in order to provide customers with a better online shopping experience. Customers do not have to wait for the checkout pages to refresh. 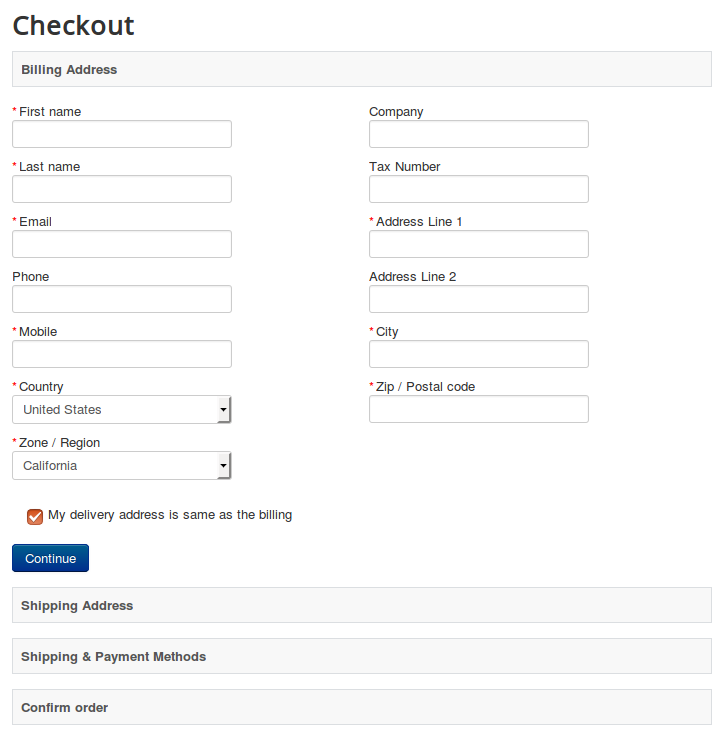 The entire checkout is handled within a SINGLE PAGE and the checkout steps are loaded in an accordin style. Please check if you have enabled conservation caching in Joomla Global configuration. If yes, disabled caching in global configuration and then check if checkout works. Also make sure you have not enabled System - Page Cache plugin and System - J2Page Cache plugin. If you are using any JS optimize plugin, that will also cause this issue. You can see the Developer Tools window opening at the bottom of the browser. Navigate to the Console tab. If the problem continues, go to Joomla admin - system - System Information tab. IMPORTANT NOTE: The following instruction applies only to those running PHP on a FreeBSD operating system. Sometimes, it might also be because of a small misconfiguration. Please make sure that you have set the option Prevent user from checking out if no shipping is selected under J2Store->setup->configuration->cart. VERY IMPORTANT: This option should be set to Yes only if you have shipping methods configured and want to stop the user from creating an order without selecting the shipping costs. If not, this might block the checkout process. Sometimes, customers will be redirected from the Shipping and Payment step to the first step (Loop). Or you may not be able to proceed when you click Continue at the Billing or the Shipping step. Make sure the following fields are set as per the configuration given below. And then do a purchase and see if the checkout works fine. If you still face issues, then there could be several reasons for this behavior. Please create a private ticket (Go to the support menu ) and provide super user logins. One of our developer will help you troubleshoot and solve the problem. Make sure you are not having any old template overrides. If you are using a template like JSN One, you might be having template overrides for checkout layout. It is because the permission you have given at Joomla global configuration might be wrong. Go to Joomla global configurationMove to Permissions tabUnder Public, choose Not Set to Site Login.Under Registered tab, choose Allowed to Site Login.Save. If you are using the content component K2, then please make sure the K2 user profile has been disabled in confgiuration. How to set default payment option in checkout payment step ? Go to J2Store > Configuration > Cart tabYou can see the param named "Default payment method"Choose your payment method from the dropdown listSave. Edit the files and make your changes and save.